Yesterday was a practical update just indicating what was going on, but today will feature some more eye candy. 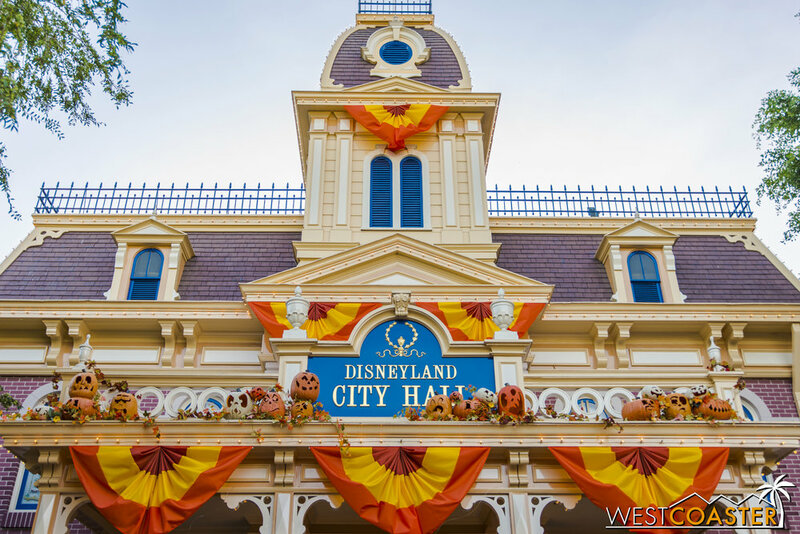 As the Diamond Celebration has packed its bags, the Halloween season has descended upon the Disneyland Resort, bringing with it the oranges and yellows of autumn to replace the blues and silvers of the 60th Anniversary decorations. Most of this is concentrated on Main Street and the west side of the park, so lets take a look at these areas! 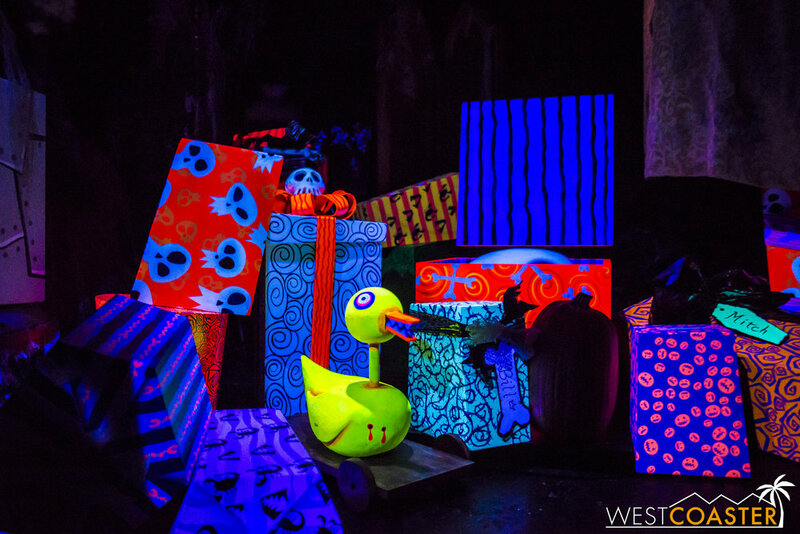 A Halloween display along the Mickey and Friends parking tram route. 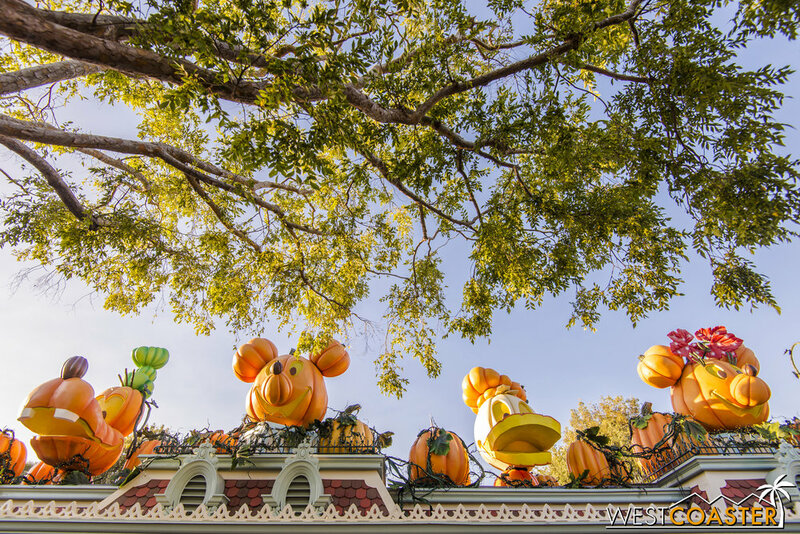 Those familiar fun jack-o-lanterns have reappeared on the facades of Main Street, bringing with them that sense of old-fashioned small town Halloween--where charm and fun were the goals rather than actual scares. These might be the same decorations we see every year, but they're still cute and photogenic. 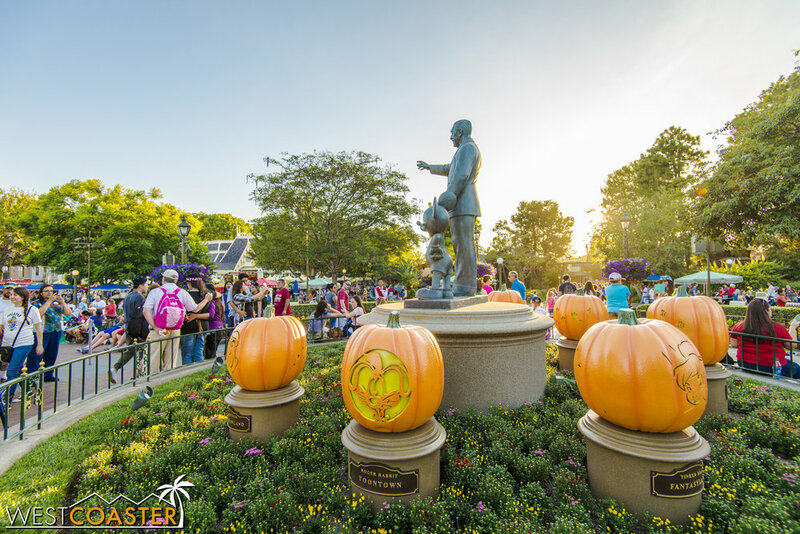 Those pumpkin Disney characters are back across the entrance gates of Disneyland Park. Inside, the giant "diamond" and the 60th Anniversary signage are gone, replaced by fall colors and florals. On the other side of the gates, advertisements of Mickey's Halloween Party are up. They are typically Mondays, Wednesdays, and Fridays this year. 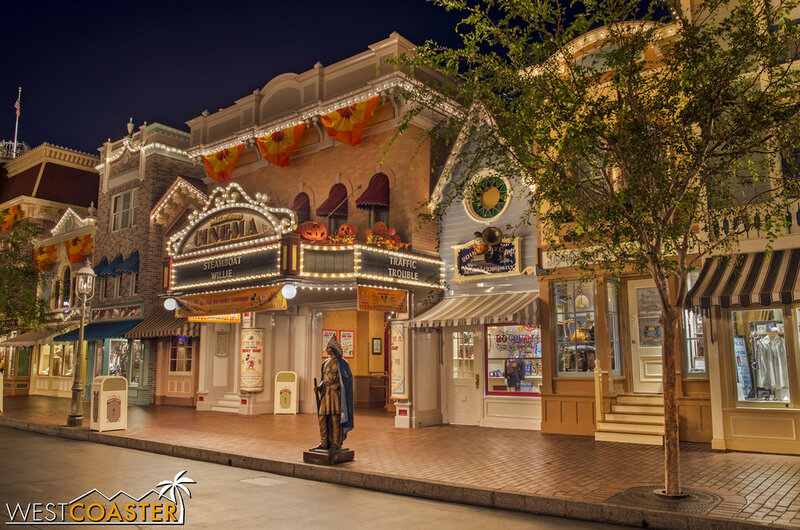 Buildings across Main Street are adorned in Halloween decorations. 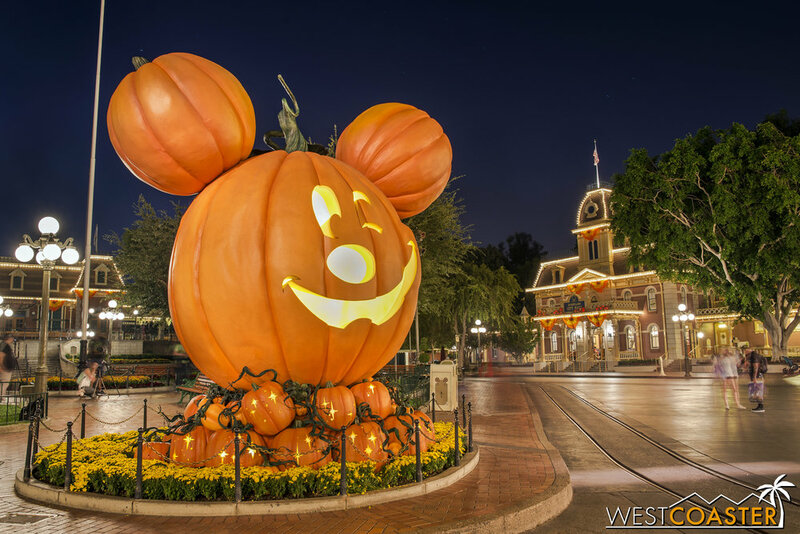 The giant Mickey pumpkin is once again at the head of Town Square. 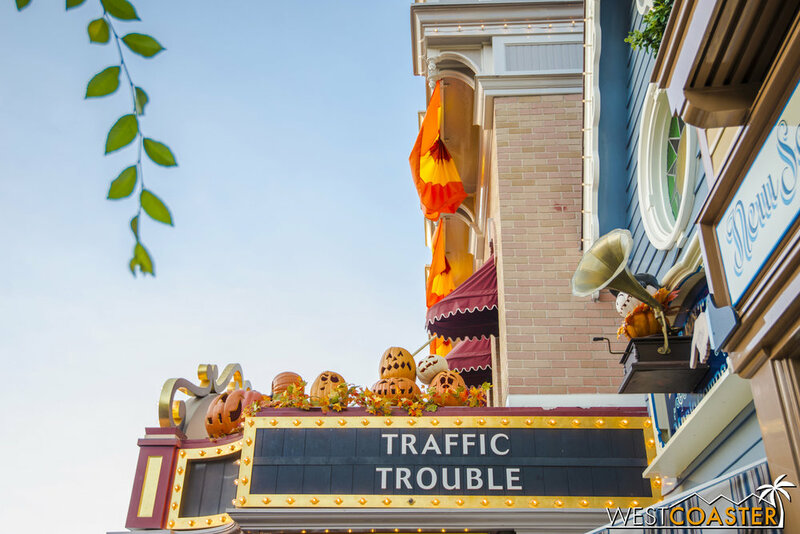 Smaller jack-o-lanterns dot the storefronts of Main Street. 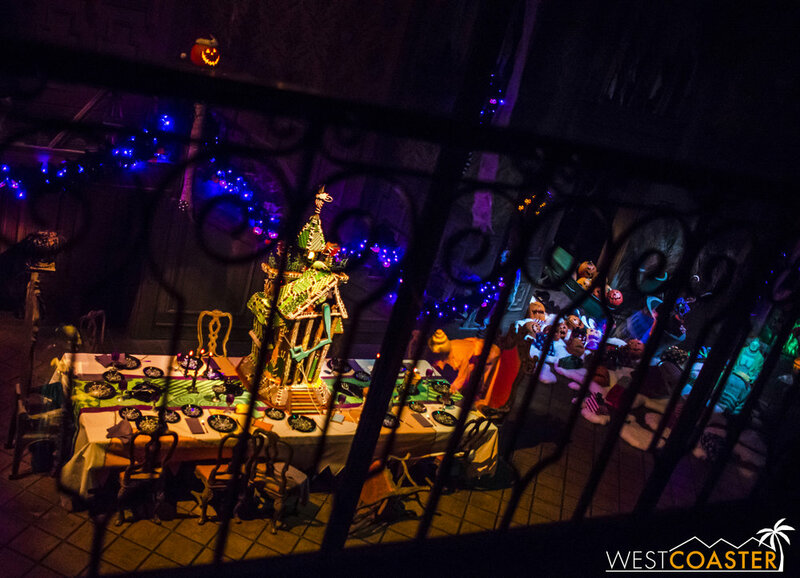 I do love the old-fashioned spooky holiday ambiance they give Main Street. 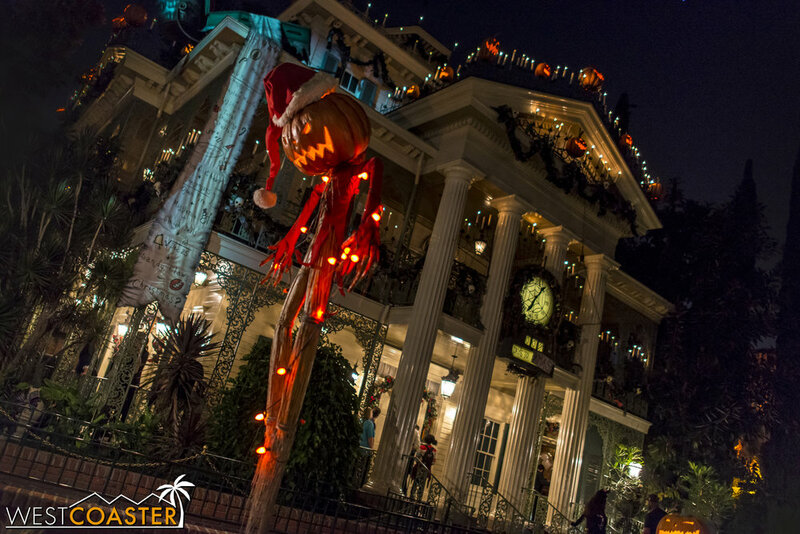 And all the way up to the Partners Statue, with the character jack-o-lanterns around it. 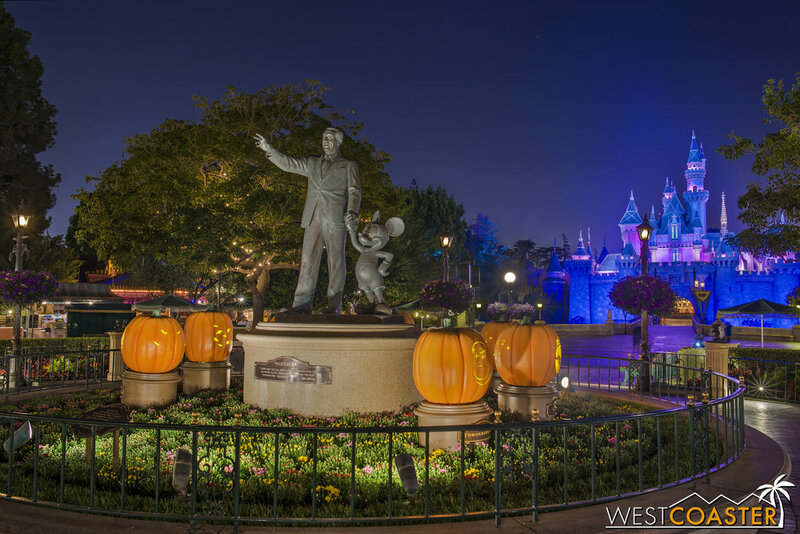 Halloween Time plus no-black-out dates mean a lot of busy crowds at Disneyland! As mentioned yesterday, Space Mountain Ghost Galaxy has take up residence. This is my favorite overlay of the famed E-Ticket. It's actually a little bit scary (for the average Disney guest), and the idea of a giant interstellar spirit is actually pretty intriguing. 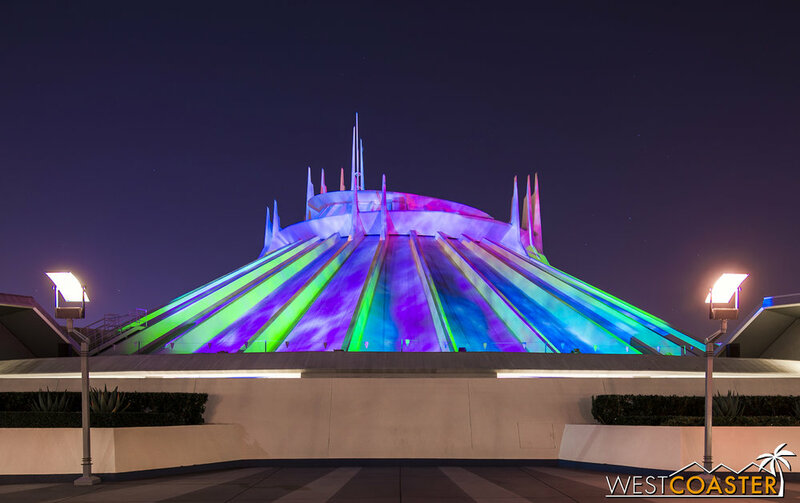 Plus, at night, Space Mountain is lit up in different projections, and every once in a while, the structure seems to come alive in a cacophony of monstrous shrieks and sound effects. 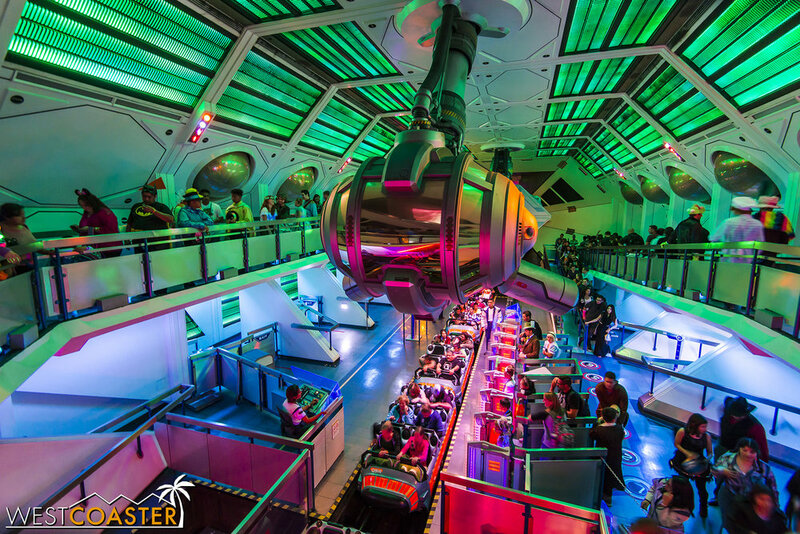 Space Mountain: Ghost Galaxy at night. Something definitely looks a little awry here. Just as with previous years, the Día de los Muertos display at Zocalo Park--just outside of Big Thunder Mountain Railroad--and the Christmas tree across from the shooting gallery have gone up. That's standard fair for this area of the park. The Día de los Muertos display at Zocalo Park. These displays are colorful and nice, but I do think it'd be nice to have something new after all these years. On the other hand, I adore the Halloween Tree, and I don't mind that recurring exactly as is every year. Inconsistent? Maybe. But mostly, I mean new additions, not necessarily replacements. 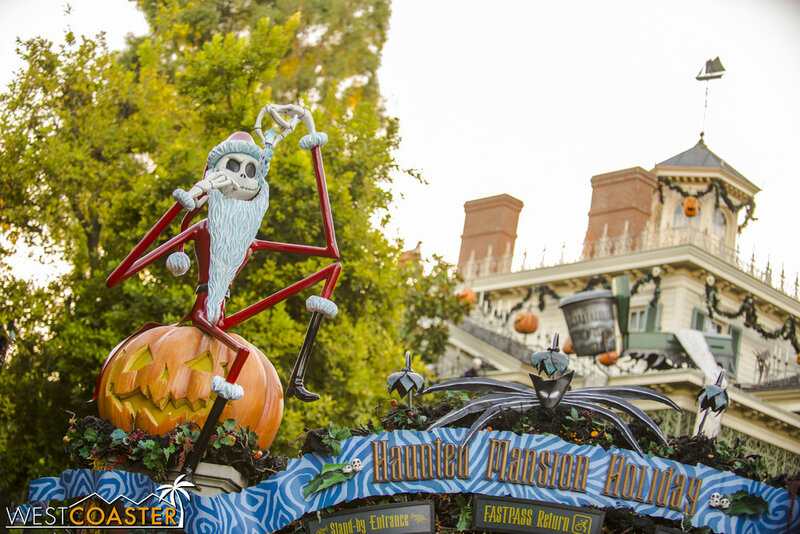 The Nightmare Before Christmas is back in New Orleans Square, and this year, its overlay of the Haunted Mansion has taken on a Sally theme. 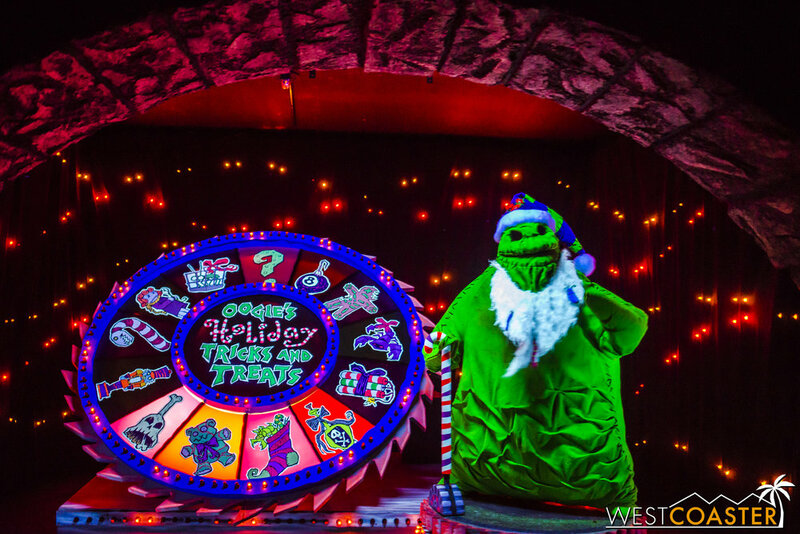 Most of the ride is the same as last year, but the gingerbread house looks stitched together and features a familiar blue-green arm sticking out, putting on the finishing troweled frosting finishes, while a wholly new Sally animatronic has taken up residence in the graveyard. Both look absolutely great, and opening day crowds clearly reflected guest eagerness to see the new offerings. Once again, he's wrecked the halls. You'd think that they'd get better home security after all these years. Some cute decorations up on the hill of the graveyard. And of course, more pumpkins outside, to honor the Pumpkin King. Here's how things look at night. Scarecrow Jack is perched by the queue. This all looks quite welcoming. Lets take a ride. There's Vampire Teddy, always up to his pranks. Here's a coffin, a great Christmas present--per Jack. A holiday wreath that you may not want to hang. 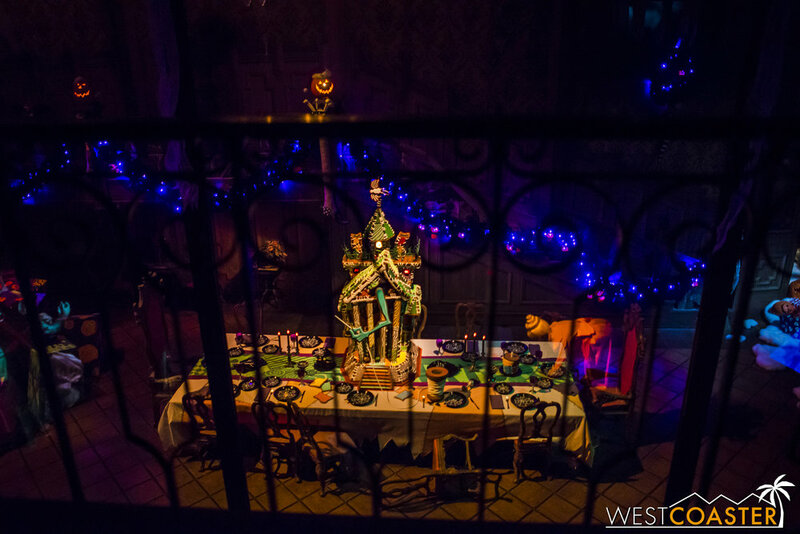 Madame Leota gets all ornamental. Lets continue onto the Ballroom. As usual, it is kickass this year. It's quite sewn together, isn't it? One more from the left angle. Onto the attic, and vampire duck. 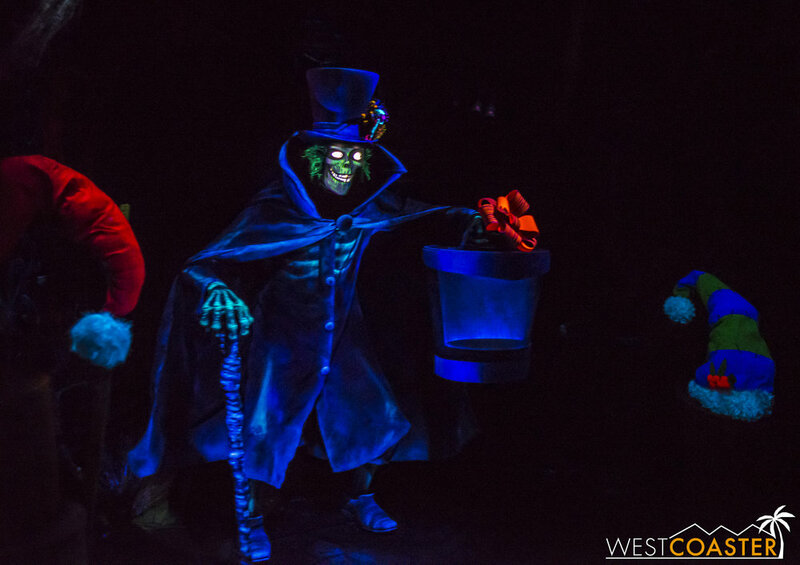 The Hatbox Ghost is still around. He looks pretty! Oh so pretty! Sandy Claws admires his handiwork. Look at all that Christmas, scattered around. The new Sally animatronic looks beautiful. No projections or anything. It's 100% mechanical. Grim Grinning Pumpkins serenade the scene. The other spirits enjoy the supernatural party. It's all quite fun revelry. 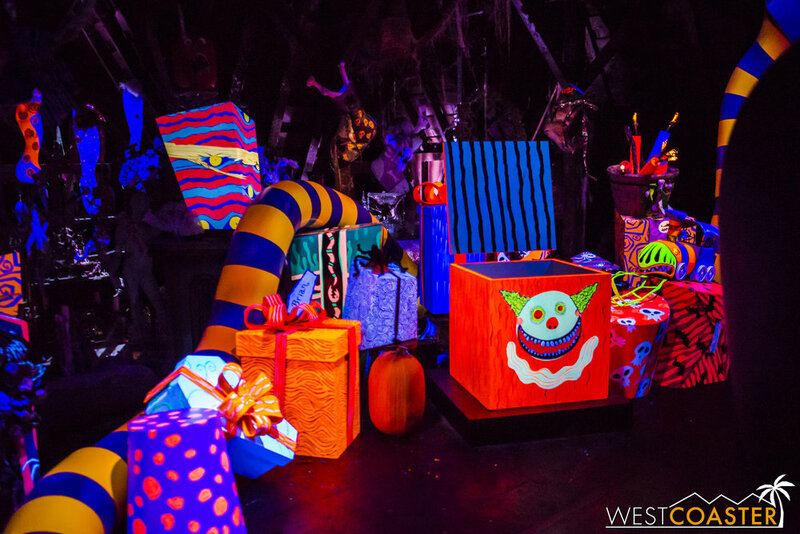 Just watch out for Oogie Boogie's tricks as you conclude the tour. But do hurry back... and be sure to bring your... death certificate. We'll close this out with some nighttime photos of Main Street during Halloween Time, because they're pretty pictures and everything, and who doesn't love some nice photos of Disneyland? We'll start at The Hub again and work back to the front of the park. The Penny Arcade looks lovely. 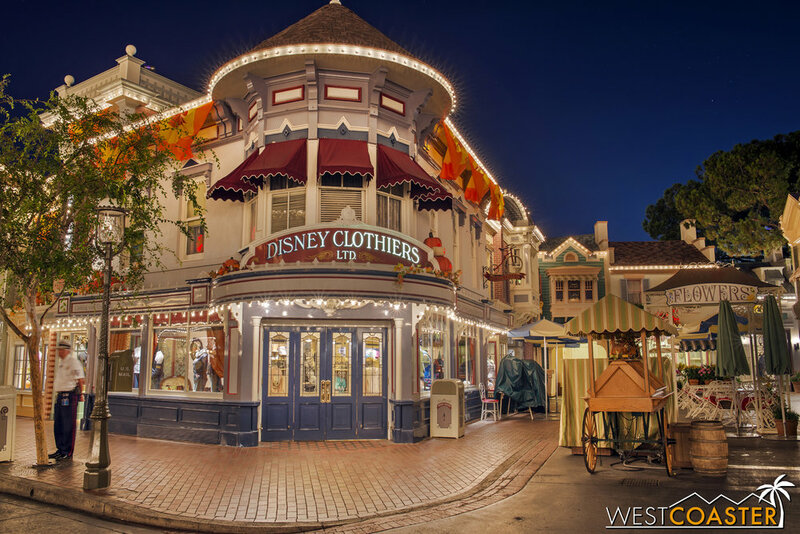 Disney Clothiers, with under-exterior-refurbishment Market House beyond. Looking down the west side of Center Street. Then across the east side and Disney Clothiers. Moving on to Crystal Arcade. The details of the storefronts are lovely as well. 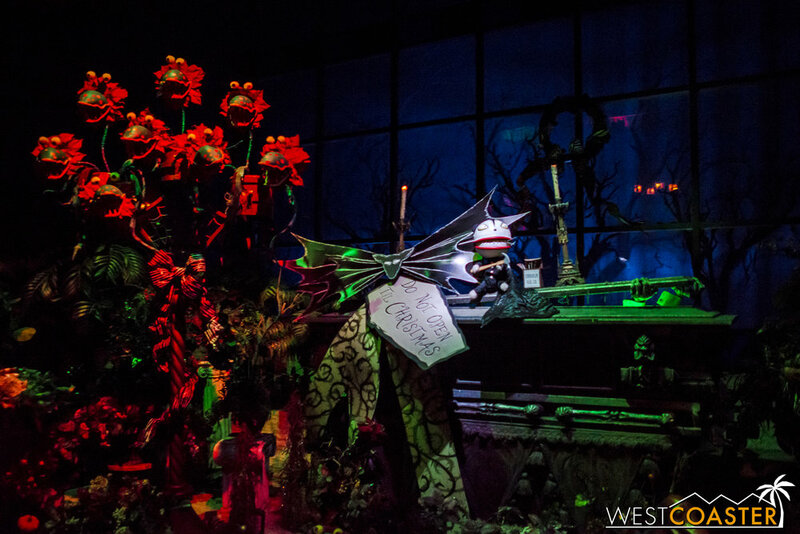 Each has been decorated with its own spooky overlay. Onto the Main Street Cinema. Good night, Disneyland. 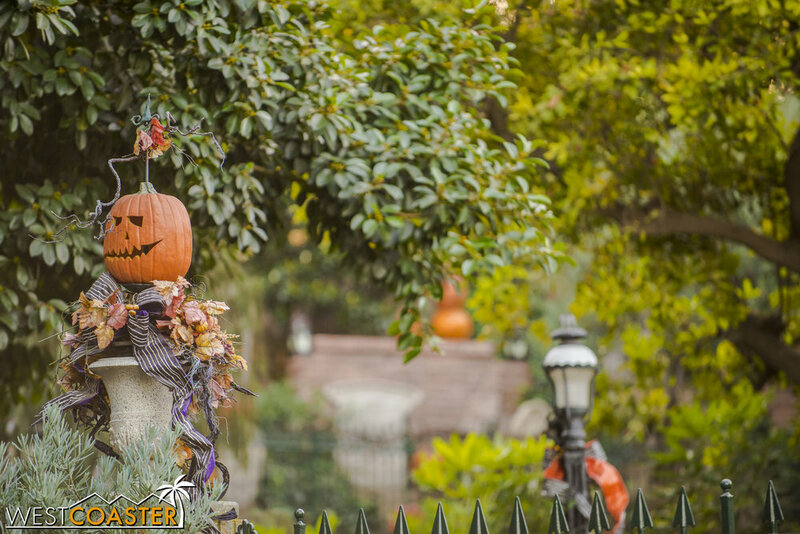 Fortunately, Halloween Time continues through the end of October! Since this Disney update is more photogenic than usual, I'll take this moment to do some shameless advertising and tell you that if you like photos like this, you should check out my Disney parks photo blog, Disney Photoblography, for a new post every day featuring a photograph (or multiple) from Disney parks all around the world. And tell your Disney loving friends to visit too! I'd definitely appreciate it! That does it from the Disneyland Resort this week. The next few weeks will focus more on the big Haunts across Southern California--Universal Studios Hollywood Horror Nights, Knott's Scary Farm, and Dark Harbor, as they open in weekly succession through the end of the month. Stay tuned for coverage of those events, plus other independent haunts throughout Halloween season. We'll have a few other features this week as well.